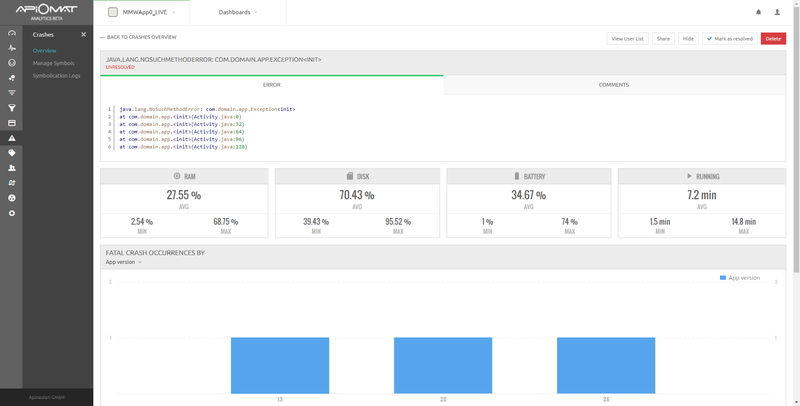 To help ensure you deliver a great user experience and a stable application, ApiOmat Analytics includes crash reporting in real-time. You can view which errors are occurring, which users are experience crashes and identify crashes based on OS, device, carrier network and other criteria so that developers can fix issues as quickly as possible. 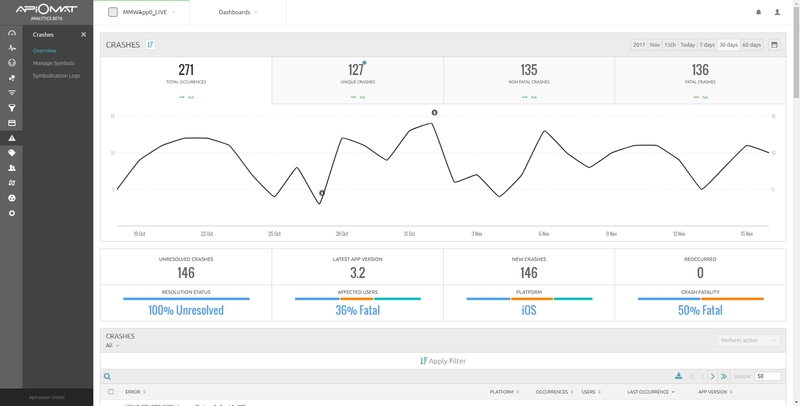 The crashes page comes with an overview dashboard as well as a detailed list of crashes. 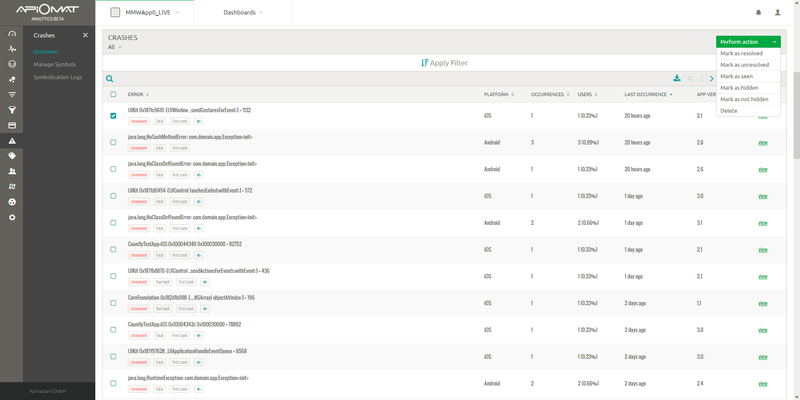 You can apply filters to the list to identify specific issues, devices, app versions any other relevant information. Simply select the errors from the list and click on perform action, as shown in the image below. You can access a detailed report by clicking on view from the list of crashes. The detailed view offers details into the error message, the state of the devices at the time of the crash (RAM usage, Disk usage, battery level, time app was running) as well as detailed information about what devices and app versions are effected, how often the crash occurred. 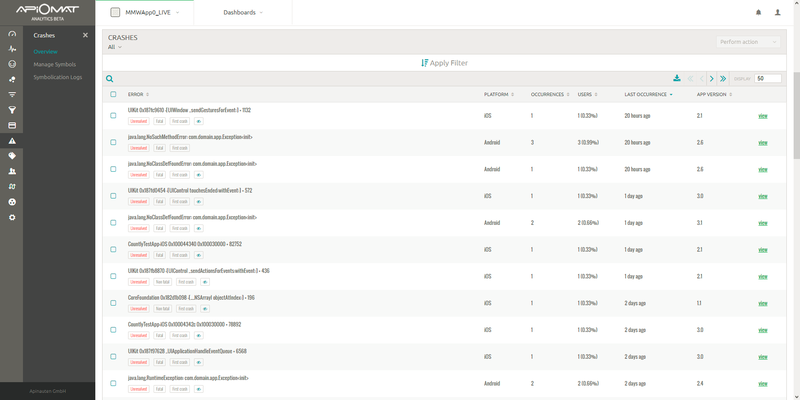 Users can share the report with developers who do not have access to ApiOmat Analytics and comments can be made. Once the error has been addressed, it can be marked as resolved. Additionally, if you are using the user profiles, you can view exactly which app users have been effected by the error.